The Wolverines are KenPom's No. 1 adjusted defense and allow the second-fewest points per game nationally. With the Wildcats shooting just 43.9 percent this season, scoring will be tough to come by for Vic Law and Co. The total for Tuesday's game in Evanston is 128. Scoring should be tough to come by on Tuesday as No. 5 Michigan battles Northwestern (8 p.m., BTN) in a matchup of strong defenses and slow-paced offenses. The betting trends and metrics agree the Big Ten game could go UNDER the 128 total. The 6-point favorite Wolverines are KenPom's No. 1 adjusted defense and are also first in FTA/FGA (18.1) and second in effective FG percentage (38.8) on defense. They allow the second-fewest points per game, including allowing the lowest shooting percentage inside the arc. With the Wildcats shooting just 43.9 percent this season, scoring will be tough to come by for Vic Law and Co. UNDER is 4-3 for Michigan this season as they have held their first eight opponents to under 40 percent shooting from the floor. UNDER is 4-4 for Northwestern this season but is 14-6 in their last 20 vs. Big Ten including this week's 68-66 loss at Indiana in which they shot 50 percent from the floor. UNDER is also trending for Michigan against winning teams. UNDER is 7-1 in Wolverines' last eight games vs. a team with a winning percentage above .600. UNDER is 6-2-1 in the last nine meetings between the schools. 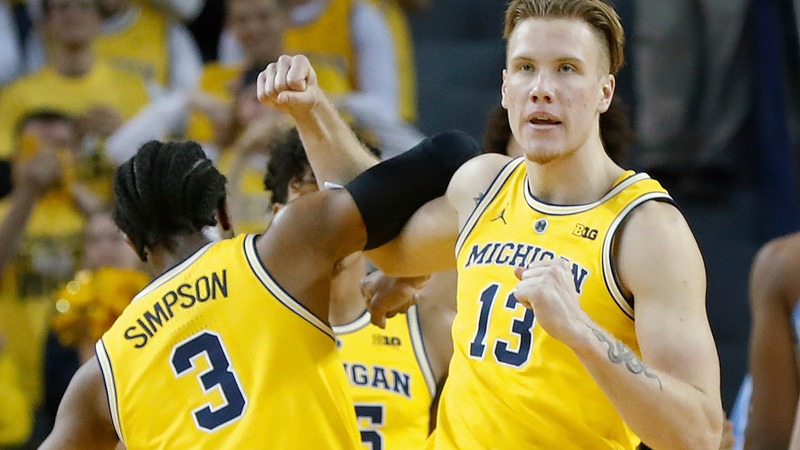 Michigan ranks 327th in adjusted tempo, while Northwestern is 250th and faces a difficult matchup with leaders Dererk Pardon and Law squaring up against Ignas Brazdeikis and 7-footer Jon Teske. Consider the UNDER on Tuesday from Welsh-Ryan Arena. __MORE:__ [Latest NCAA Tournament 2019 odds, AP Top 25 rankings](https://www.betchicago.com/ncaa-tournament-2019-odds-michigan-ap-rankings) ## KenPom prediction Michigan 67, Northwestern 61 __Play and win:__ [Join our free contests](https://betchicago.chalkline.com/) ## College basketball betting lines, tips for Tuesday, December 4 *Odds from Westgate LV SuperBook; all times Central Note: Games below are nationally televised. For complete schedule [click here](http://www.espn.com/mens-college-basketball/scoreboard/_/group/50/date/20181204). __New Hampshire at Seton Hall (-26.5, 141.5), 5:30 p.m., FS1__ Betting tip: New Hampshire is 0-7 ATS in its last seven games overall. __Northeastern at Syracuse (-11, 137), 5:45 p.m., ACCNE__ __Indiana at Penn State (-3, 136.5), 6 p.m., BTN__ Betting tip: UNDER is 12-3-1 in Hoosiers' last 16 road games. Senior center Juwan Morgan (leg) is questionable for Indiana. __Saint Peter's at Clemson (-21, 136), 6 p.m., ACCNE__ __Oklahoma (-3, 143) vs. Notre Dame from Madison Square Garden, 6 p.m., ESPN__ Betting tip: UNDER is 10-4 in Irish's last 14 overall and is 5-1 in Sooners' last six. __Miami FL (-5.5, 144.5) at Penn, 6 p.m., ESPN+__ Betting tip: Hurricanes are 8-22 ATS in their last 30 games following a straight up loss. __Providence at Boston College (-3, 139.5), 6 p.m., ESPN2__ Betting tip: Providence is 5-15 ATS vs. non-conference teams since last season. __Wofford at Kansas (-16.5, 151), 7 p.m., ESPN+__ Betting tip: Terriers are 7-1 ATS in their last eight road games. __UNC Asheville at Auburn (-36, 139.5), 7 p.m., SEC Network__ Betting tip: OVER is 22-5-1 in Tigers' last 28 home games vs. a team with a road winning percentage of less than .400. __McNeese at Mississippi State (-28.5, 140), 7 p.m., SEC Network__ Betting tip: McNeese is 4-12 ATS in its last 16 non-conference games. __UTEP at Marquette (-21.5, 142), 7:30 p.m., FS1__ __South Dakota at Colorado (-11, 146), 8 p.m., PAC12__ __Florida (-1.5, 142.5) vs. West Virginia from Madison Square Garden, 8 p.m., ESPN__ Betting tip: OVER is 13-3 in Mountaineers' last 16 overall.